Say hello to our Make Layout Engine™. It’s here you’ll build custom page layouts, and add and edit your content. Getting started is super-simple, too. Here’s how. In the WordPress admin, head over to Pages → Add New. 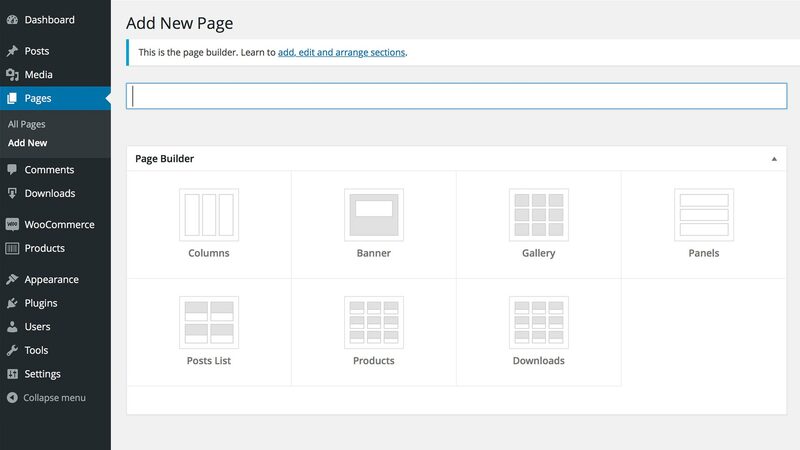 Our page builder will appear in place of WordPress’ editor. Better already, huh? Woohoo! You’re now ready to get rockin’. If the normal content editor is showing instead, find the Template option in the Page Attributes box and make sure it is set to Builder Template. Psst! If you’ve selected Builder Template but our page builder isn’t displaying, open the Screen Options panel at the top of the screen, and make sure there’s a tick in the Page Builder checkbox. Switching templates is easy, but any content you’ve added to the normal editor before switching to our Builder Template will be replaced by the page builder markup when you save your page. In other words, we think it’s best you start with a brand-new page! If you need to switch an existing page, or you’re just a trouble-maker at heart, here’s how. Head to the Edit Page screen. Find the Template option in the Page Attributes box on the right side of the screen and set this option to Builder Template.